It doesn’t look like much, but PVC pipe is an incredibly versatile building material that can be used to create furniture and awesome amenities around your home. There are some really incredible ways to utilize the pipes to make your day-to-day life much easier, all while saving some money along the way. 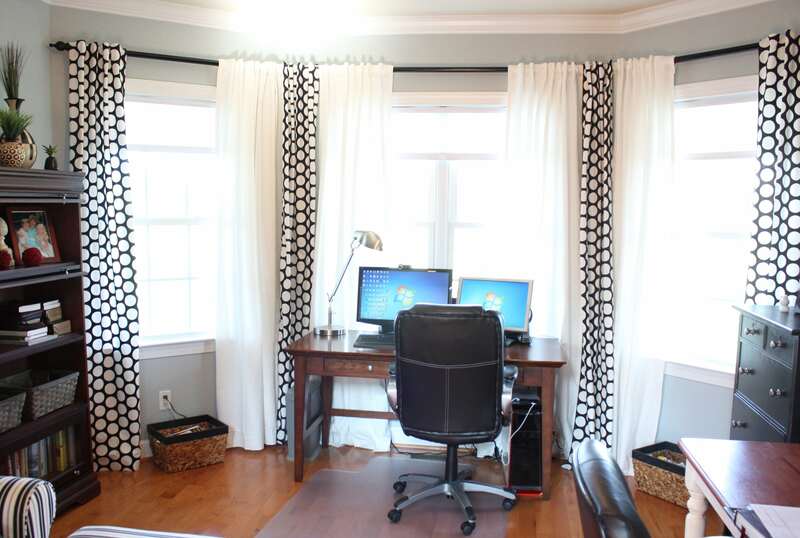 Curtain rods are surprisingly expensive, and if you’re looking for an alternative, PVC pipe might just be the way for you. There isn’t specific directions for this, but check out how 7 Layer Studio made it work for their own home here. 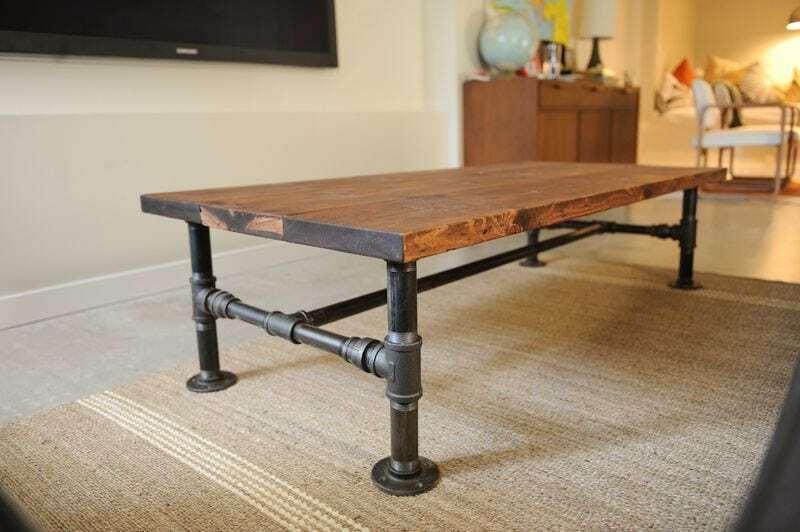 This one is definitely a little bit more complex than some of the others on the list, but it’s absolutely perfect for those looking to add an industrial vibe to their living space. With beautifully stained wood and perfectly matched in color and style with the PVC pipe, no one will know how cheap this was to put together. The full instructions can be found here. If you’re in need of a bookshelf, this one is just for you! Simple and adaptable, this is an easy way to make the bookshelf of your dream with ease. Find out how here. 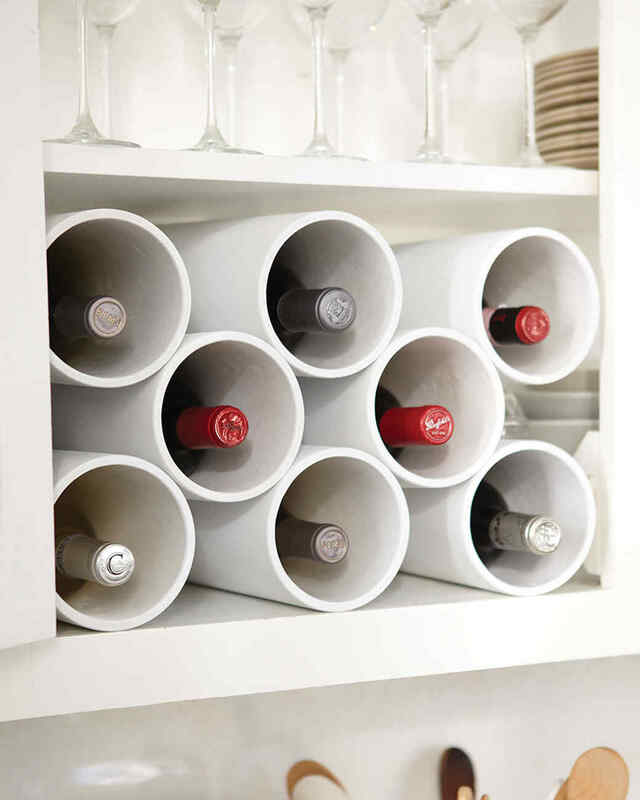 A favorite in the DIY world, it seems that everyone is building their own wine rack these days. 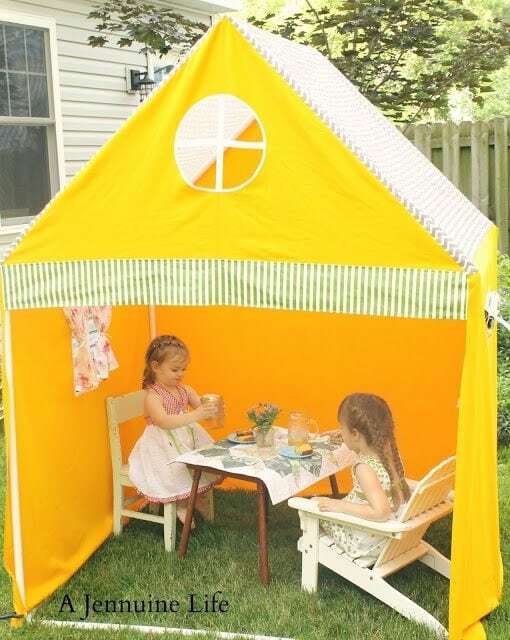 This one was crafted by Martha Stewart and her incredible DIY team. Again, this is a little complex, but with a hacksaw and some acetone, this could be in your home! Check out the full directions here. 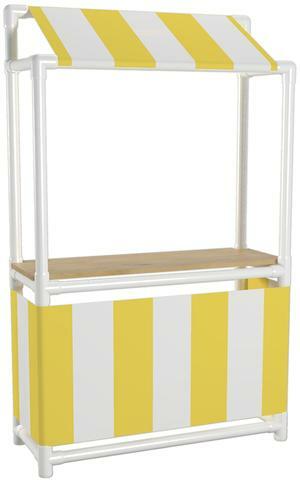 Kids furniture can seem trivial at times. 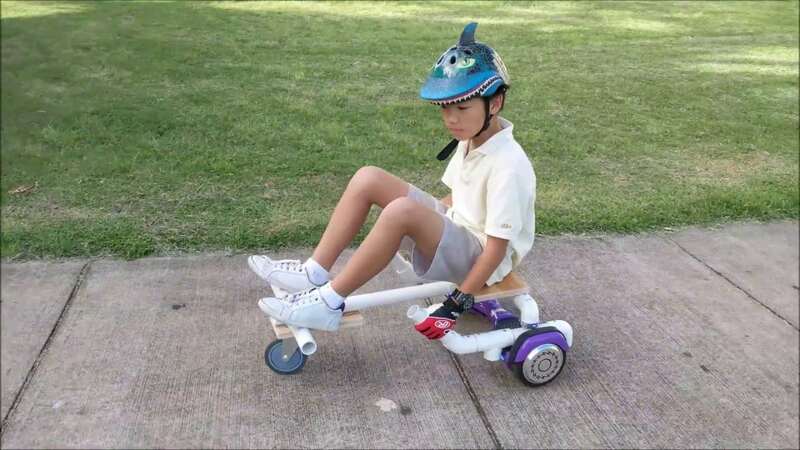 They grow so fast and soon enough, they’ll be grown out of all of their expensive items. 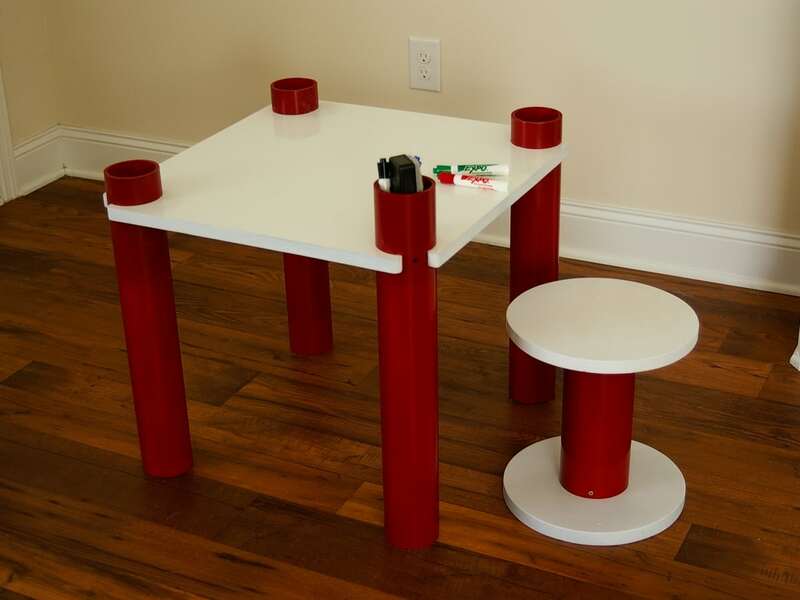 Instead, it might make more sense to make a kids table out of some PVC pipe. Simple and easy, this one is guaranteed to be a favorite for parents out there looking to save some money while still keeping their children’s room in style. Check it out here. This is absolutely perfect for anyone who hates tilting their head down to stare at screens throughout the day. Plus, these are stylish and perfect for the minimalist in your home! Check out the full details here. 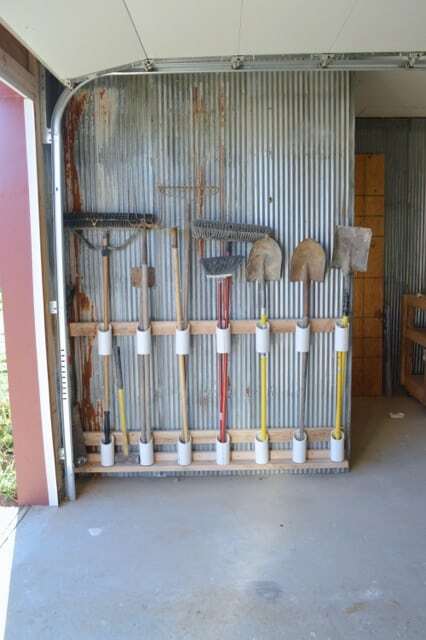 The toolshed can be a messy place but it turns out that with a little PVC pipe this can be easily resolved! 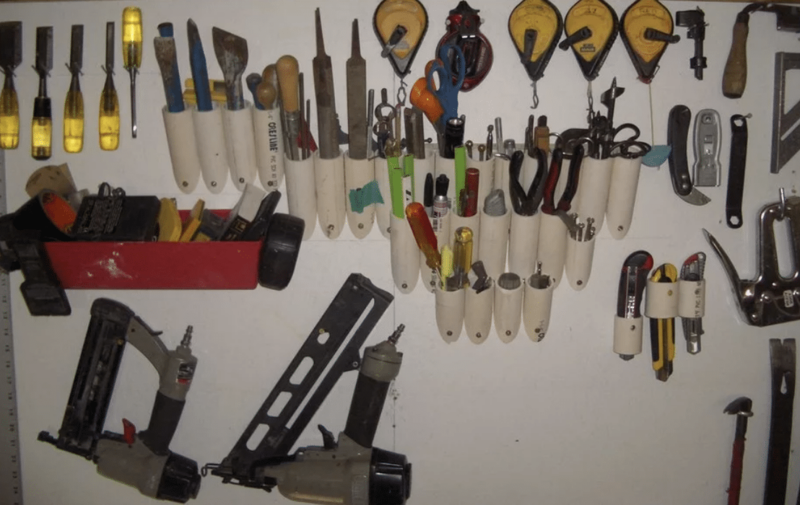 This one is perfect for anyone with a lot of tools that need a little reorganizing. Check it out here. 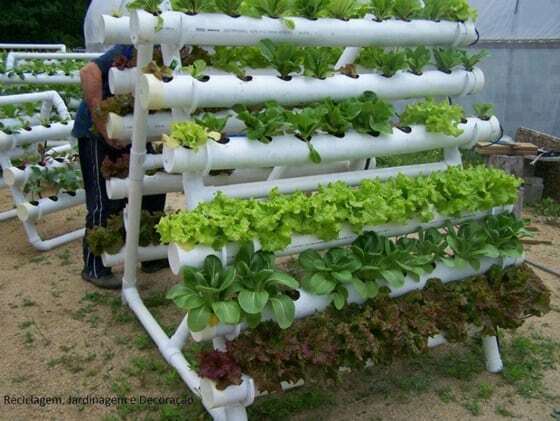 There are a lot of ideas on this site about farming/hydroponics and utilizing PVC to get it done that are all great, including a wall of succulents and tubes to grow strawberries! Fab Art DIY has a whole list of great ways to utilize minimum space to create a fruitful garden! Check it out here. Inspired by Ikea, this one is a cheaper method to getting an industrial style lamp in your home. 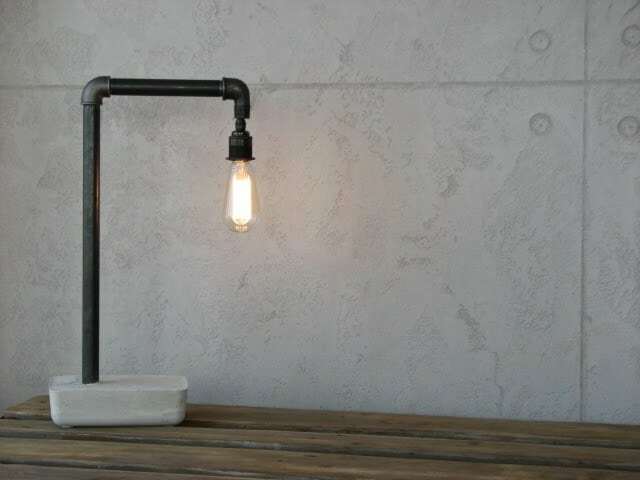 With a little pipe and concrete, this is perfect for anyone looking to have a new desk lamp in their home. Directions for the lamp can be found here. 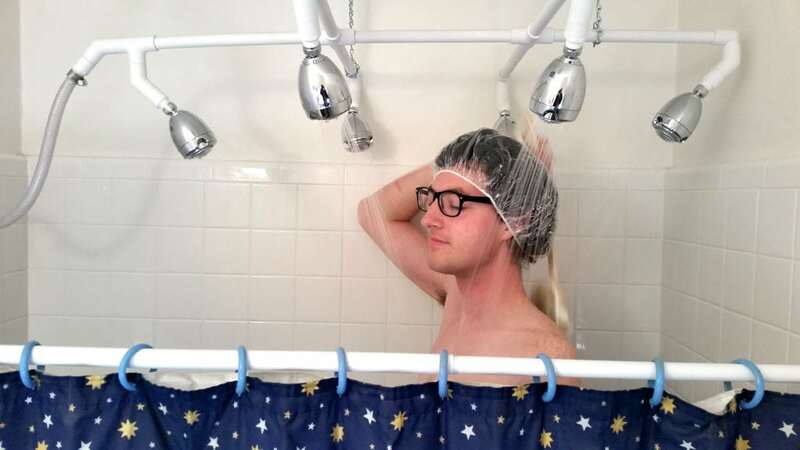 If the average shower is beneath you, this is a great way to make a luxury shower for about 60 dollars. Check out how to make this strange concoction here. Unless you have a large walk-in closest, there’s not a lot of space available for clothes in the average home. Luckily, with a little bit of PVC pipe, you can create a minimalistic addition that’ll make your room look chic while providing space. The website this was created on is based in Finland, so it’s a little hard to decipher, but with a little Google Translate, this can be yours. Read the directions here. 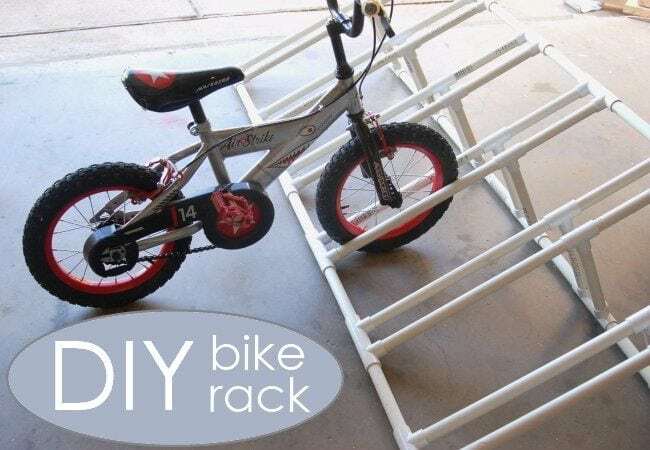 If you have a lot of children that need a place to put their bikes, consider this bike rack. Cheap, durable, and surprisingly strong, this one has got everything you need to organize your garage space. Directions can be found here. You can hang your tool guns with some PVC pipe. Just cut a piece out to fit the handle and screw it to a shelf. 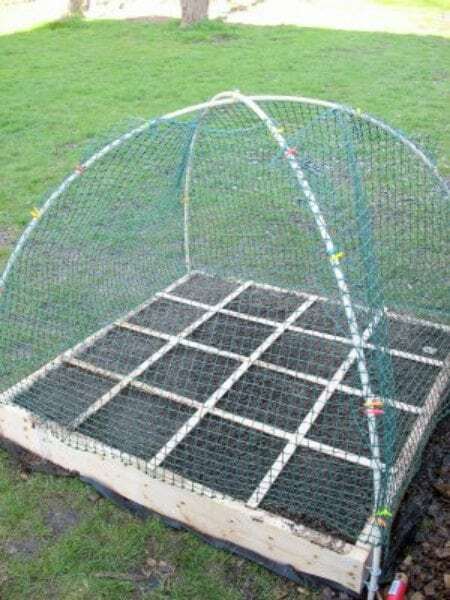 Prevent pests from getting at your vegetable and herbs by createing this covered raised garden bed with PVC pipe. Get the instructions here. Some people spend hundreds of dollars on a playhouse for their kids who will ultimately destroy it. Might as well make one yourself for well under $50. Learn how here. 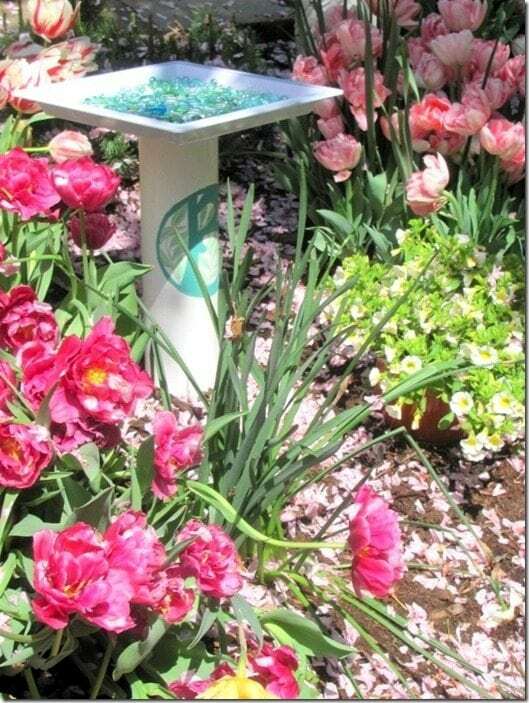 ll you have to do is glue a piece of PVC pipe to a plate and fill it with dollar store stones to create this adorable bird bath. 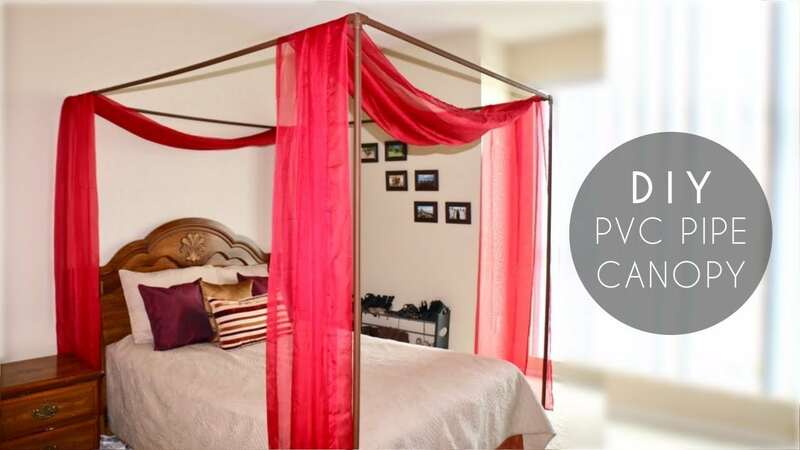 Create your fantasy canopy bed inexpensively with PVC pipe. This was made for under $30. You’d pay triple that at the very least if you bought it at the store. Learn how to make it here. 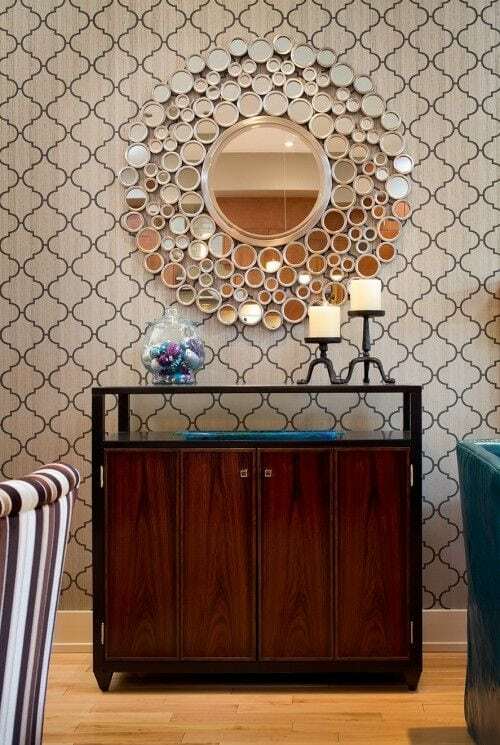 This gorgeous mirror was crafted from PVC pipe. The pipe was sliced, painted, and glued to mirrors. This project uses smaller pieces of PVC pipe. 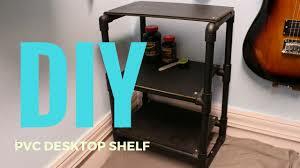 Cut up some pieces of PVC pipe and use velcro to adhere it to the inside of your cabinets for convenience. 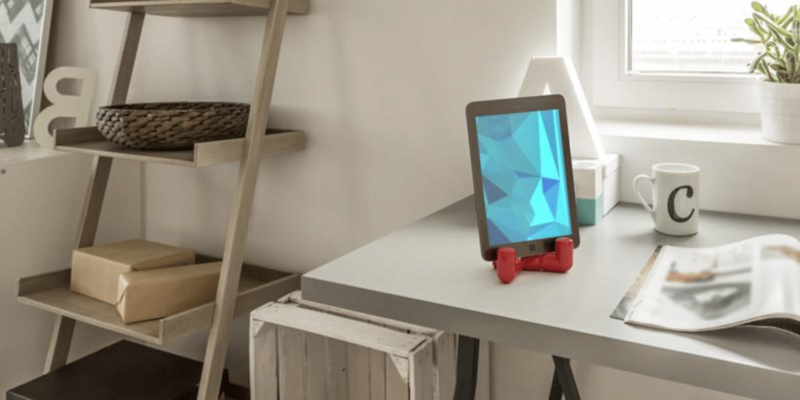 Do you need a shelf that’s perfectly customized for your desk? Make once yourself from PVC pipe. Learn how to make it here. 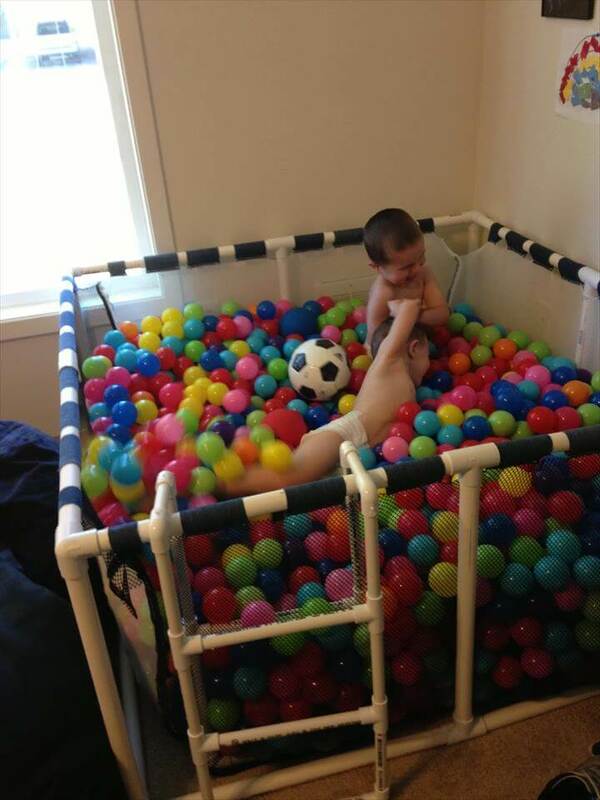 Ball pits are so damn fun. And when they are this easy to make, who needs to have kids to have them in their home! Learn how to make one here. 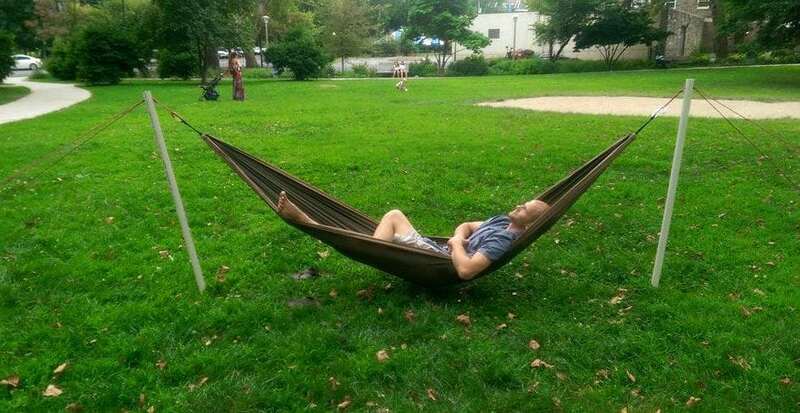 There is nothing better than a hammock nap… nothing. You don’t even need trees to make this one. Get the instructions here. This will make the perfect Christmas gift for your kids. Get the instructions here. This is another DIY project you can pass off as a gift for a child in your life. Why spend the money when they’ll go crazy over this! Learn how here. 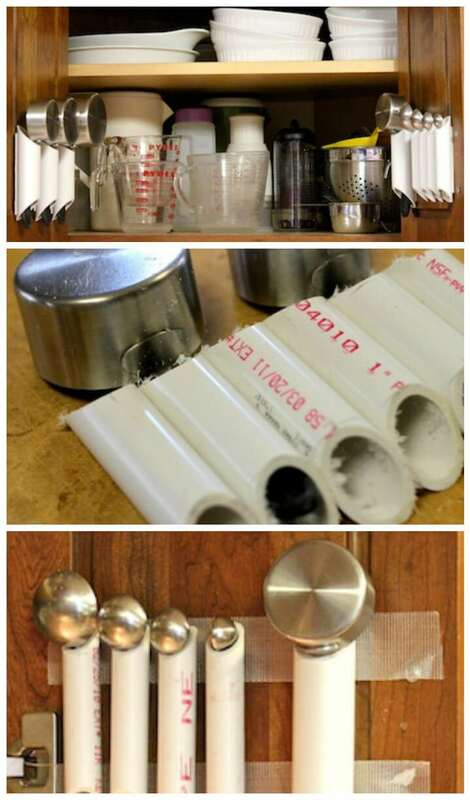 Use PVC pipes to organizer your drawers. Select PVC pipe that has thinner walls so they’re be easier to cut. Measure the height of your drawers and cut slices of pipe to fit your drawers. 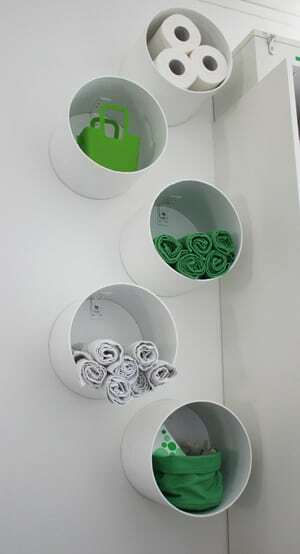 Use PVC to make a customize destop organizer. You’ll find a tutorial here. 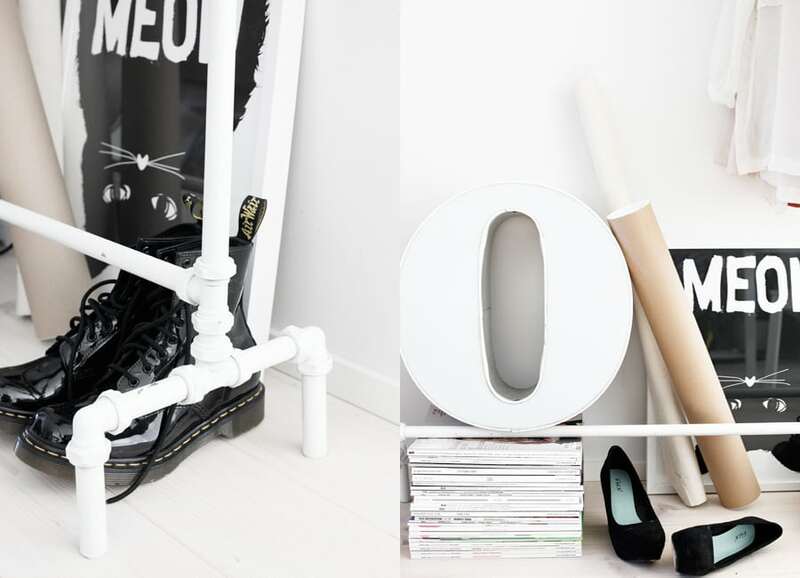 Create a perfect shoe organizer from PVC pipe. 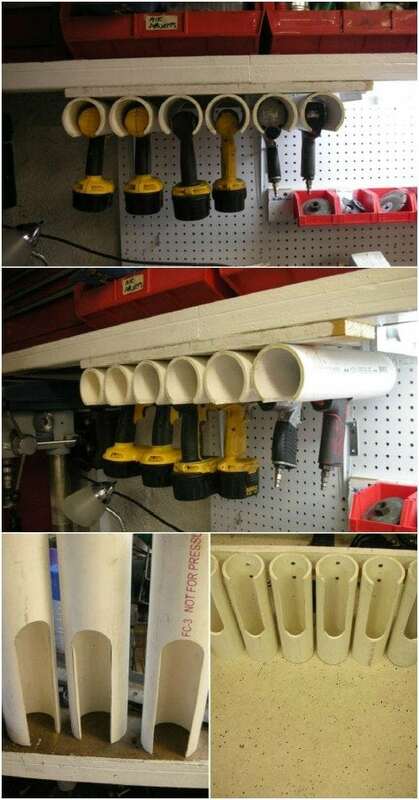 Use large pieces of PVC pipe cuts and screw them together. Keep your hair dryer nice and neat in your bathroom by making a hair dryer caddy. 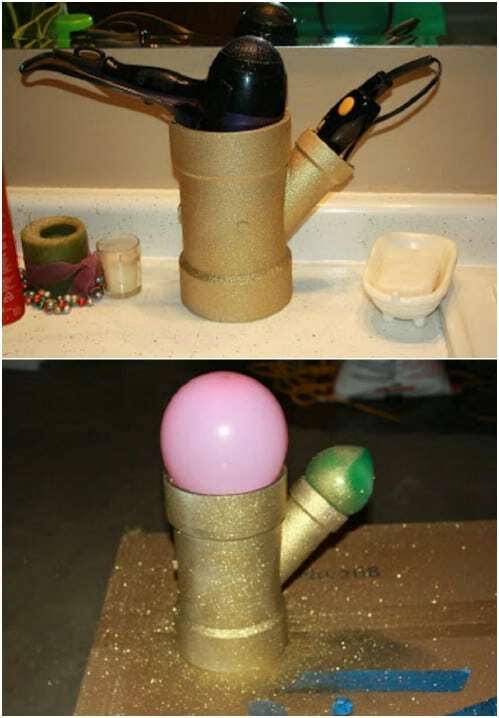 You can learn how to make one from PVC pipe here. Cut smaller pieces of PVC pipe on an angle and screw them to a wall. You can keep things like screwdrivers, hammers, and other small tools inside of them. You can find a tutorial here. 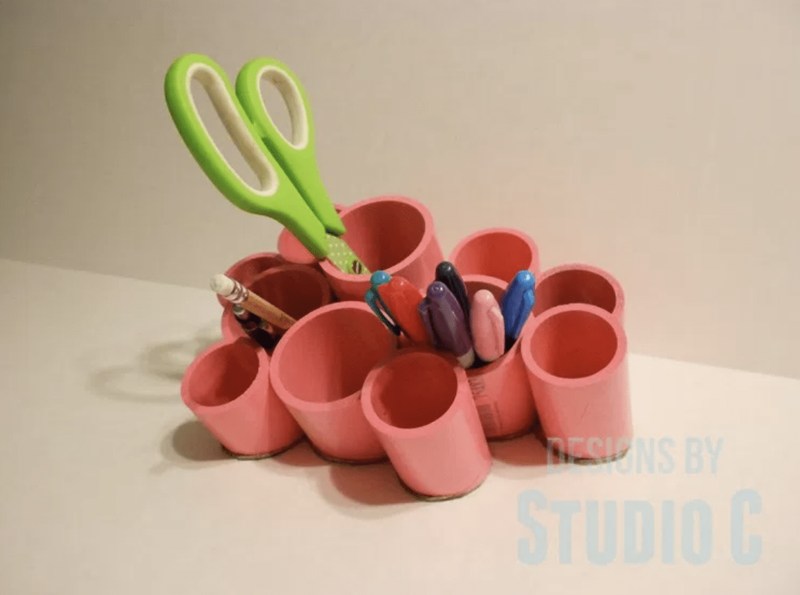 Use some PVC pipe to create a convenient holder for your ribbons. It will make it a lot easier to use and prevent it from getting tangled. Learn how to make one here. 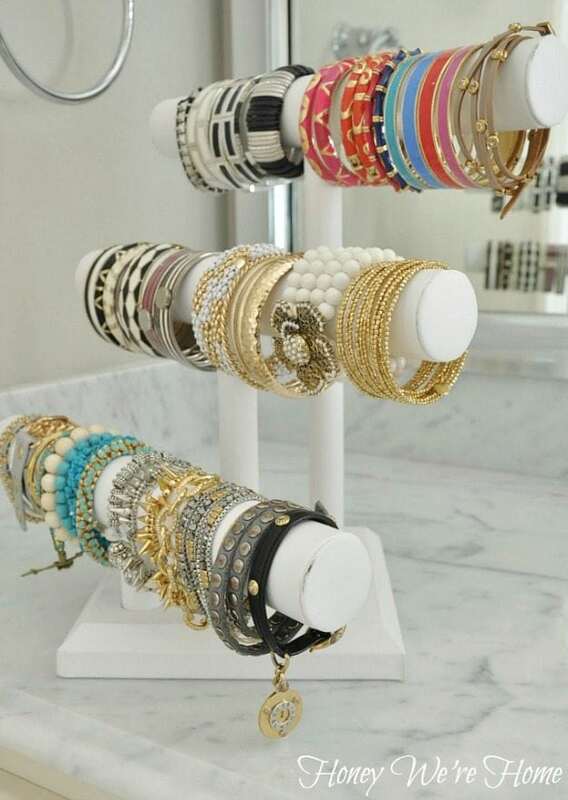 Are you a bracelet hoarder? 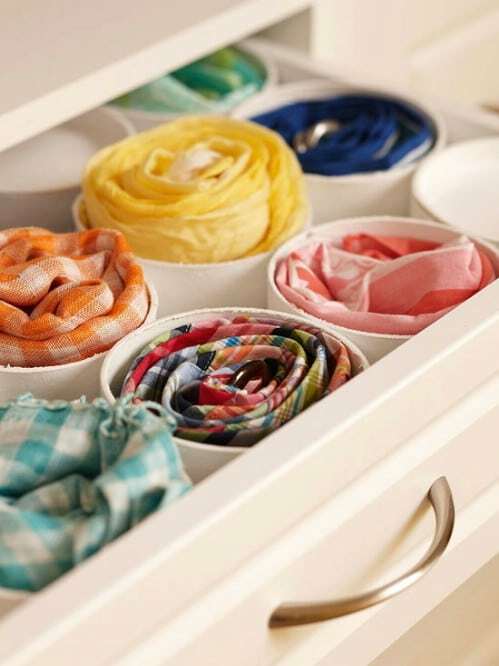 Make yourself a bracelet stand to organize them all. You can find the instructions here. 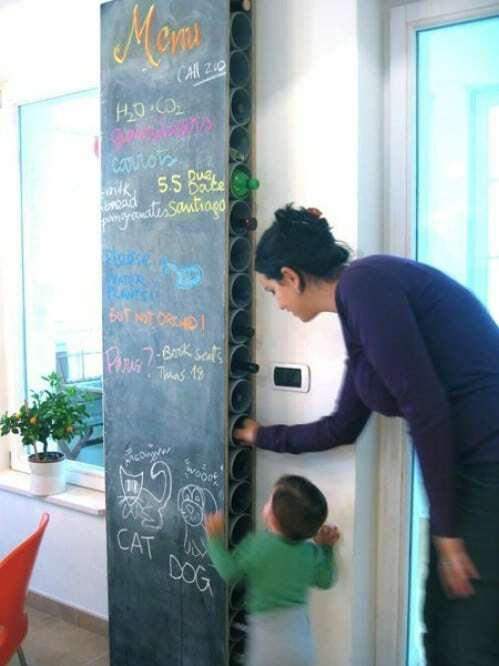 This chalkboard rack is constructed from stacked PVC pipe that is sandwiched between two large pieces of wood painted with chalkboard paint. Keep all your paints organized in one place by creating a rack. 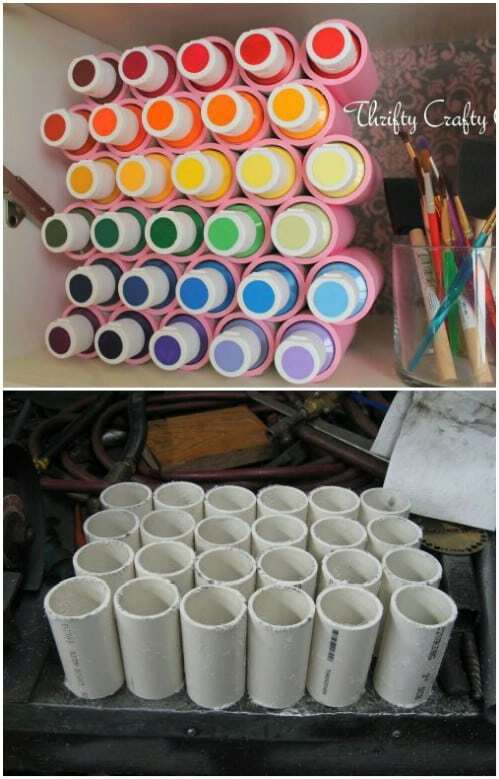 Slice pieces of small PVC pipe, paint it, then glue or screw them together. 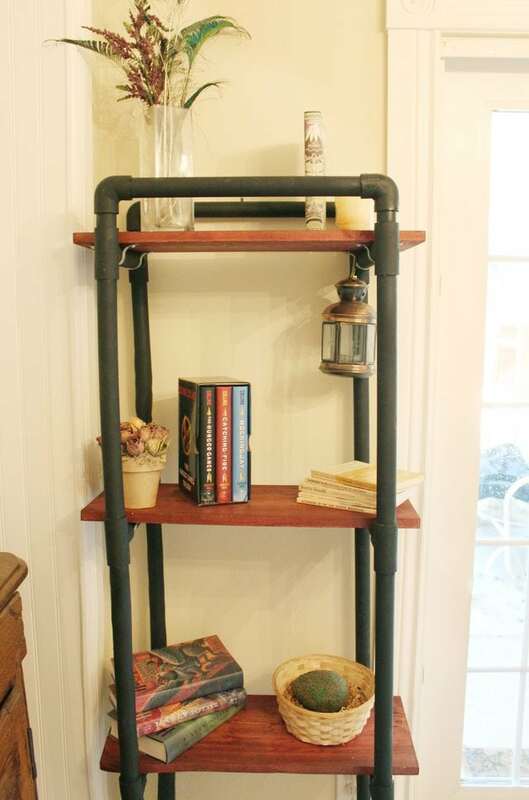 You can also use PVC pipes to create floating shelves. Use large PVC pipe, slice it and use brackets to afix them to the wall. You can store your wrapping paper neatly with some PVC pipe. 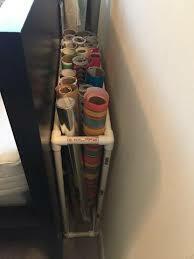 Create a caddy for it or screw some PVC pieces to a wall and slide your rolls in. 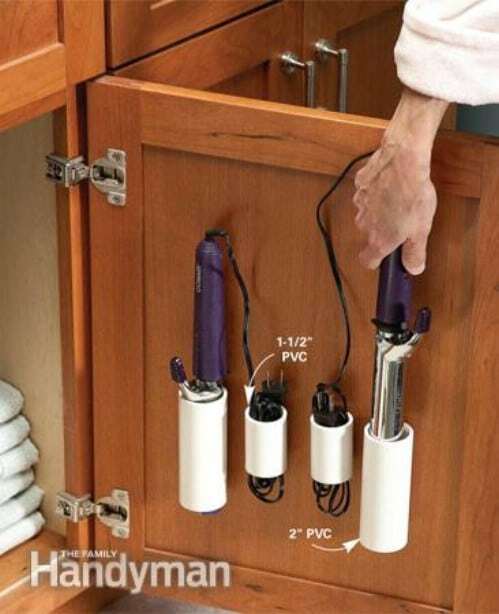 Keep your curling iron easily accessible and out of sight by screwing small PVC pieces to the inside of your bathroom cabinet. This will prevent the cord from getting tangled too. Want your tape to be easily accessible while your working on a project? 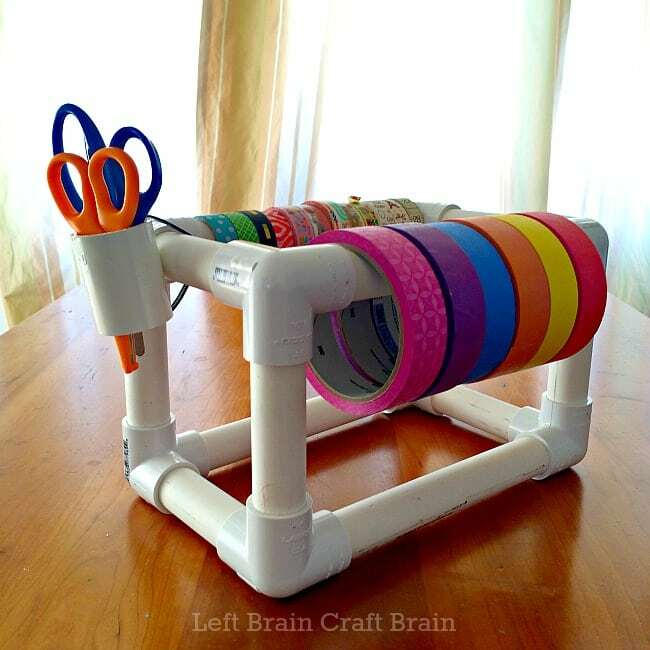 Make this cute tape caddy. Learn how here. 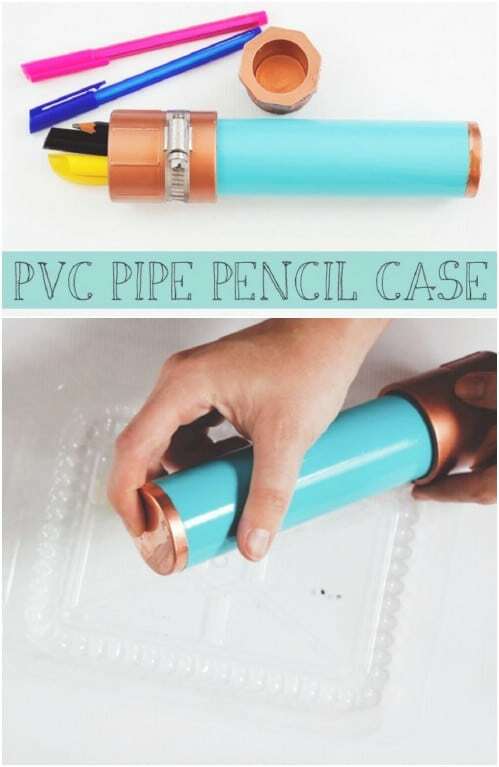 Use PVC pipe to make a cool pencil case. Paint it some funky colors and pop your pens and pencils inside. Get the details on this project here. Use PVC pieces to make these awesome succulent planters. All they needs is a coat of paint. Get the instructions here.